DMS is developed by Welles Wilder and it is used to determine if financial instrument is trending. If DI+ crosses above DI-, you should go long. Signal should also be verified by ADX: if ADX is rising while DI+ and ADX are above DI-, signal is confirmed. If DI+ crosses below DI-, you should close position. If DI- crosses above DI+, you should go short. Signal should also be verified by ADX: if ADX is rising while DI- and ADX are above DI+, signal is confirmed. If DI- crosses below DI-, you should close position. 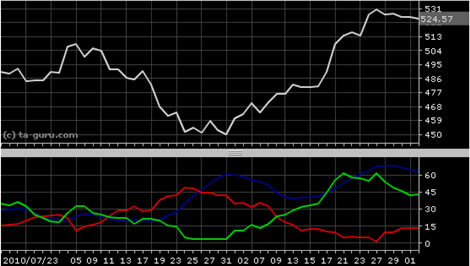 Open chart for google with DMS indicator.